Set atop the rocky plateau of Lundy Island in the Bristol Channel, the Old Light stands proudly - a monument to the skill of its builder, Joseph Nelson. It is of a pleasing construction, both solid and graceful, and when built in 1820 it had two lights - an upper and a lower, and was the highest lighthouse in the country. In this fascinating history of the old lighthouse and the fog signal station, the author has combined her wide knowledge of the island's history with information gleaned from extensive research into Trinity House's archives. Some tantalising insights into the life of the keepers and their families have emerged - the keeper who was too tall for the lantern room; the keeper's wife who tragically died of water contamination, and the gunners who poached their dinners and hid their numerous children when the Elder Brethren came to inspect the cottages! Interwoven throughout the story are details of the numerous wrecks from the 15th century until 1897. Accounts from newspapers are often included, and the wrecks are linked to the lighthouse keepers of the time and the heroic rescues performed by the lighthouse staff. There are also some wonderful snippets of island history - one owner regarded Lundy as independent of mainland authorities and issued his own 'puffin' coins and stamps - the latter are still in use to cover postage to the mainland although the coins are now collectors' items. The height of the Old Light soon proved to be its downfall and eventually the reason why it was extinguished. Due to Lundy's plateau-top fogs which completely obscured the lantern, although there was clear visibility at ground level, a programme of alterations and intensifications took place under the advice of Professor Faraday. In 1862 a fog signal station was built on the west coast, providing shipping with another warning. This was not wholly successful either and it was not until 1897 that the Old Light was replaced by new lights on lower levels at the north and south ends of the island. Since the light was extinguished, the Old Light and the fog signal station reverted to the owners. The Landmark Trust restored the lighthouse and holiday-makers can now stay in the keepers' quarters, climb the 147 steps to the lantern room, and enjoy the breathtaking views across the whole island to the coasts of Wales and Cornwall. Owned by the National Trust, Lundy Island is an outstanding area of great natural beauty which attracts many visitors, who frequently return year after year to enjoy this special place. 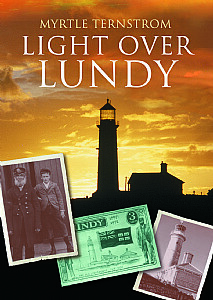 This is another collectible maritime book, which will be of particular appeal to all lighthouse enthusiasts, anyone who is interested in history and everyone with an affection for Lundy Island.